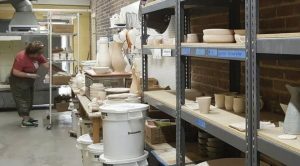 The Village Potters Clay Center is located along the French Broad River. Most days, this ancient river looks rather lazy from where we sit, and in the summertime we see hundreds of tubers floating on its waters, basking in the sun. Recently, during the last week of summer, we were dealing with a different type of river. Hurricane Florence was just a couple of days away from working its way inland, and predictions were grim. 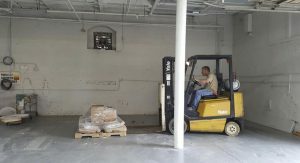 We had two days to pack up as much of our 13,000+ square foot facility as we possibly could and move it to higher ground. What I witnessed over those two days seemed quite miraculous. 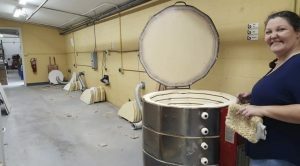 The Village Potters Clay Center consists of about eight people at its core. Those eight people put out a call for help, and many able bodies showed up. 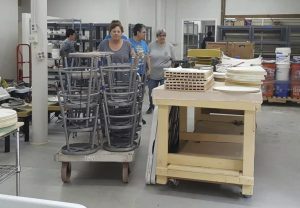 We had students from our teaching center, apprentices, advanced ceramics students, and even some of their loved ones, come and go throughout those two days. We really saw our community come together. 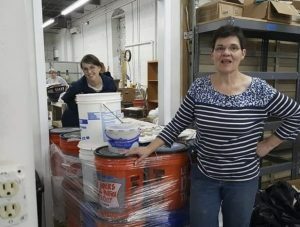 With what felt like a village at work, we moved 10 kilns, more than 20 wheels and tables, over 50 shelves, three slab rollers, at least 11 tons of clay, and so much more! 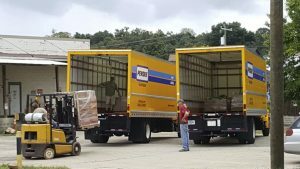 Everything was packed and moved to the second story or onto one of three 26-foot trucks. Almost the entire Village Potters Clay Center was empty in an incredibly short period of time! Sunday arrived and we awaited what was supposed to be tropical depression rains, but by some stroke of luck, the worst of the storm missed Asheville almost entirely. We decided to take the following day and do a deep clean of the studio while it was empty, and almost the same Rockstar crew showed up to put The Village Potters back together again! Many hands really do make for lighter work, and seeing them all making this gigantic feat possible warmed all of our hearts. We could not have accomplished such a task without the beautiful community of people that come together at the Village Potters. Clay creates so much more than pots!